An English cottage print sundress from Bernie Dexter gets extended for the change of Seasons with vintage accessories Fall-friendly footwear. Fall is my favorite time of the year. It always has been. But I'm just not quite ready to let go of Summer yet, in no small part because I love sundresses so much. As it turns out, it's pretty easy to extend sundress season with a few accessory and accent switches. 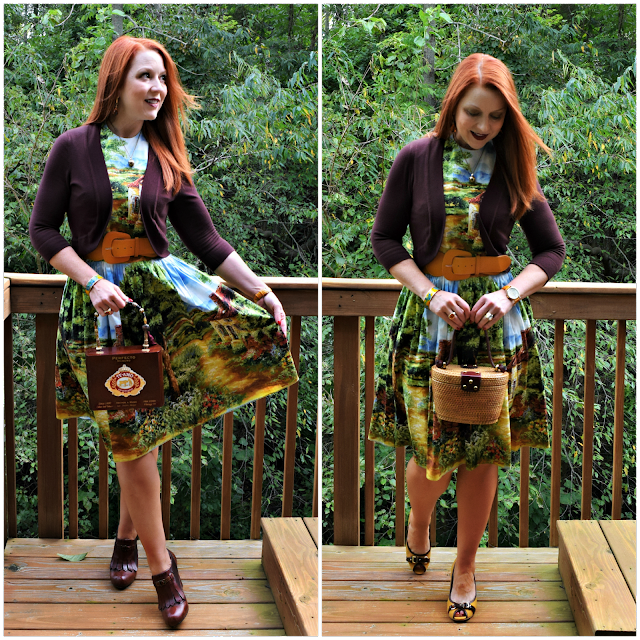 Two recent vintage handbag finds inspired me to keep this Bernie Dexter dress in rotation as the leaves change. 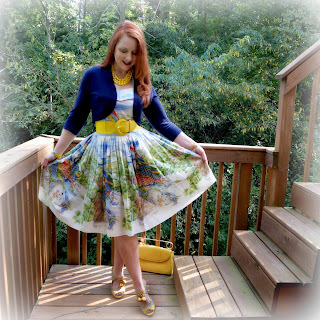 Earlier in the Summer, I paired the dress with bright yellow and blue sandals, a lightweight blue cardigan and belt, and my favorite yellow safety pin clutch (see it here). But, I like it just as much with a chocolate brown sweater and mustard yellow accents that play up the more autumnal hues in the vibrant English cottage print. I've had these linen and leather Diba pumps for years, but I never considered them for this dress until I brought home the 1970s woven wicker and leather bucket by Aigner. I found the bag at Queen Bee Vintage, one of my favorite local vintage stores. The bag is evocative of classic picnic totes, so while it may not be right for the dead of Winter, I'm already looking forward to carrying it more next Spring. When it rains it pours, I guess. The same week I stumbled on the vintage Aigner at Queen Bee, I also found this absolutely "perfecto" wood cigar box bag at the monthly Indy Arts & Vintage Marketplace. Hiding in the vendor's silver Airstream Trailer parked in a shady corner of Broadripple Park, it's made from an actual cigar box. Each time I open it, I'm greeted with the beautiful smell of cedar. It was bargain-priced at $15, and has turned out to be quite the conversation piece every time I've carried it. 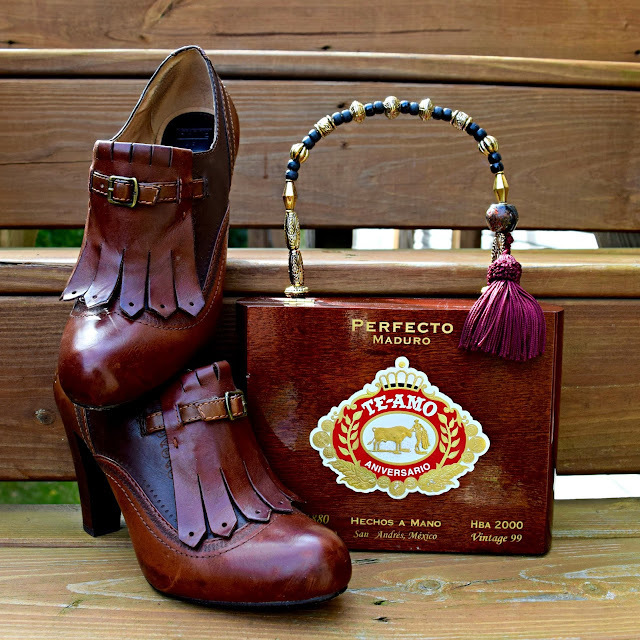 The ankle boots are from Frye; The bag is upcycled from an actual cedar cigar box. The fact that the bag is made from a cigar box also brings back fond memories of my childhood, when I used my Dad's empty cigar boxes to hold all manner of treasures. I even used them to make Valentine's Day boxes for school (covered with quilt batting and fabric to hide their origins, of course)! 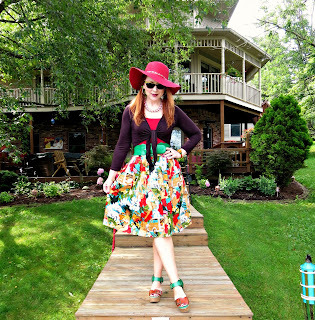 If you're a vintage fan, I highly recommend checking out both Queen Bee and the Indy Arts & Vintage Marketplace. I found the cigar box bag tucked into a corner of this airstream trailer. 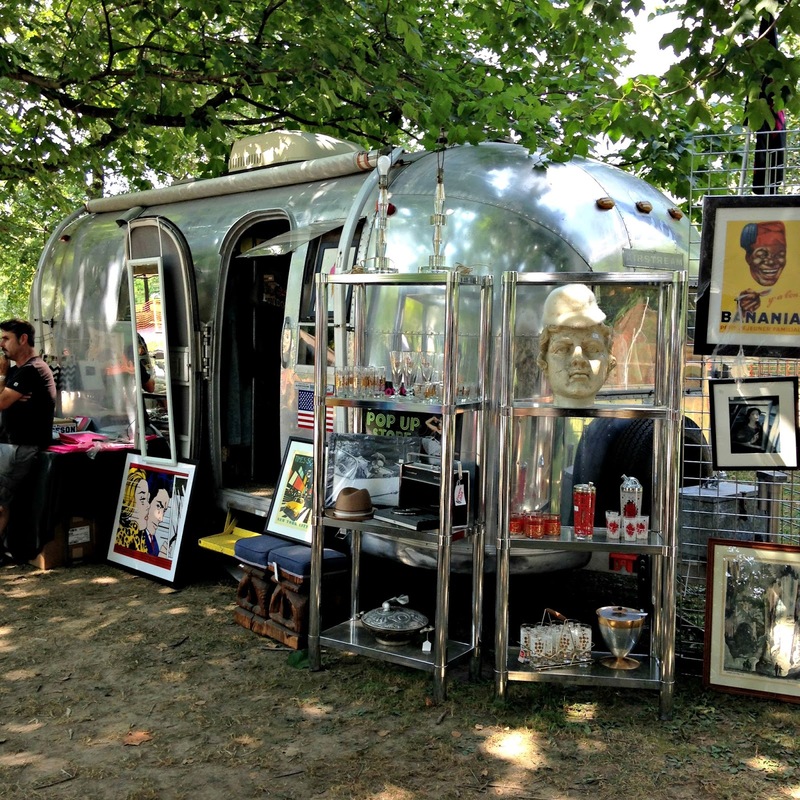 The Indy Arts & Vintage Marketplace, held monthly at various locations around the city, is a fun way to make unique discoveries.